Monday 9.00 a.m. - 1.00 p.m.
from Tuesday to Saturday from 9 a.m. to 8 p.m.
From Tuesday to Saturday from 9.00 a.m. to 8.00 p.m.
On Monday 9.00 a.m.-1.00 p.m.
from Tuesday to Friday from 9.00 a.m. to 2.00 p.m. and from 3.00 p.m. to 8.00 p.m.
On Saturday from 9.00 a.m. to 2.00 p.m.
Tuesday and Thursday, from 10.00 a.m. to 1.00 p.m. and from 4.00 p.m. to 7.00 p.m.
Wednesday and Friday, from 4.00 p.m. to 7.00 p.m.
Saturday, from 11.00 a.m. to 1.00 p.m.
Free access for an hour maximum. Monday from 9.30 a.m. to 12.30 p.m.
From Tuesday to Saturday, from 9.30 a.m. to 7.30 p.m.
On Monday 10.00 a.m.-12.00 p.m.
from Tuesday to Saturday from 10.00 a.m. to 12.00 and from 4.00 p.m. to 8.00 p.m.
from Tuesday to Saturday 4.00 p.m. to 8.00 p.m.
from Tuesday to Friday from 10.00 a.m. to 8.00 p.m.
Saturday from 9.00 a.m. to 1.00 p.m. and from 3.00 p.m. to 8.00 p.m.
from Tuesday to Friday from 9.00 a.m. to 2.00 p.m.
Tuesday and Friday from 11.00 a.m. to 2.00 p.m.
Wednesday and Thursday from 11.00 a.m. to 5.30 p.m.
Tuesday and Thursday from 3.00 p.m. to 6.00 p.m. 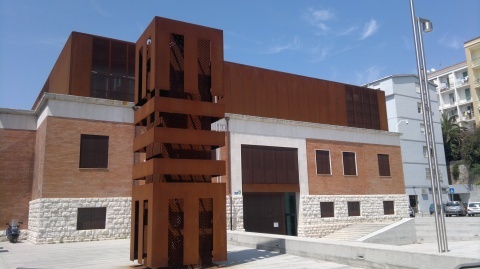 The MEM – Media Library is located in Via Mameli, in the historic district of Stampace, in the space that was from 1923, for 28 years, the stadium of Cagliari and then, in the 50's, the Civic Market. The transparent glass façades show the functions hosted inside, the places dedicated to study and cultural enjoyment. The elongated planimetric shape is balanced by the deformation of the façades widening in the middle to mark the centrality of the main entrances at the MEM.